In the early 2000s, a proposed transnational oil pipeline called Keystone XL had begun to meet resistance from landowners and ranchers in the midwestern plains whose land might be affected if the pipeline were built. But then it caught the eye of environmentalist groups. The pipeline's proposed path would cross the U.S. border with Canada, and because of that, it would need approval from the president of the United States in order to be built. It was 2011. President Barack Obama had expressed his concern about climate change — and climate activist Bill McKibben saw an opportunity. He organized mass protest. But he didn't just include environmental groups — McKibben's climate change activists were joined by Nebraska ranchers and Native American tribes who didn't want the pipeline crossing their land and threatening their water supply. People came by the thousands to rally in front of the White House and across the country. The demonstrations continued — for years. 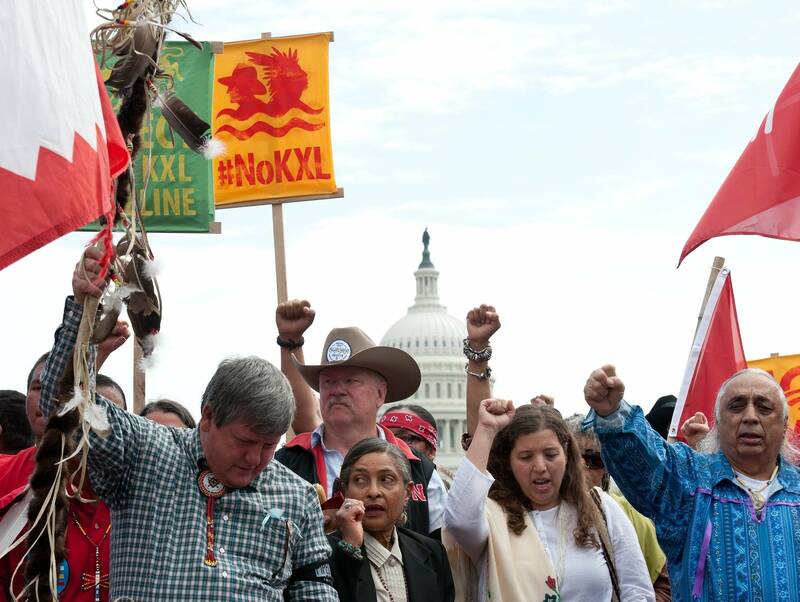 Keystone XL had galvanized a movement. It quickly became one of the most powerful symbols in the fight against climate change. Before Keystone, few people in the U.S. gave much thought to pipelines. There would maybe be some local opposition. But if an energy company said they needed to build a pipeline to get oil or natural gas to markets, then for the most part, they built it. Since then, though, it's not just local landowners fighting pipelines in their backyards anymore. It's environmental groups, and Native Americans, and farmers and ranchers, and a crucial addition to the alliance: climate change activists. "People did rally around it because it was something that they could pretty easily understand: Something that was black and white, right and wrong," said environmental consultant Kenny Bruno. "They could come out and say, 'Yes, we were against the pipeline because it's bad for the climate and this is something we can work on and we can throw our energy into.'" The movement that started with Keystone has grown, and now just about every pipeline proposal meets opposition on the grounds of climate change. When a pipeline plan comes up, climate activists push against it, saying society needs to move more quickly away from fossil fuels that emit the gases that cause global warming. Infrastructure, they say, is destiny — and the more new pipes we put into the ground, the more we solidify our use of oil into the future. But society relies on the oil carried by those pipelines for everything from fueling vehicles to manufacturing the soles of our shoes. And the fossil fuel industry is fighting back, against what some call a "Keystonization" of pipeline projects. They're starting activist groups of their own, with support from energy companies, some labor unions, manufacturing groups and residents of areas that benefit from fossil fuel industry jobs. "Pretty much everything has oil in it, it's insane," said Arik Forsman, an economic development representative at a northern Minnesota power company — and a supporter of Minnesota's Line 3 pipeline replacement project. Forsman, like many of his colleagues, is quick to point out that he believes in climate change, and fossil fuels' contribution to it. But he believes if there's demand for oil, it's going to get drilled or mined or fracked somewhere, regardless of whether or not a single pipeline through Minnesota gets approved. "Until we're either willing to sacrifice some of our current quality of life that we all have, or technology really advances to the point that we we don't need things like oil, I do think there's a there's a case to be made for for celebrating a resource that allows us all to do the things we do everyday in life." This conflict over our reliance on oil and the climate risk it poses isn't going away, and nobody seems to know for certain where it's heading. Why no one agrees on Line 3 pipeline's climate change impact | MPR News reporter Elizabeth Dunbar dug into the carbon footprint of a proposed oil pipeline that would run across northern Minnesota. How can a pipeline contribute to climate change? It depends who you ask. Where the Keystone battle is today | President Trump wants to get the Keystone XL pipeline finished, and he's still meeting resistance — years after the project was first proposed. The Atlantic writes: "Because that which has never lived cannot really die, the Keystone XL — the grinding, symbolic climate-change fight of the Obama era — has returned." The environmental cost of oil's journey to the U.S. | From the MPR News archives, an analysis of the environmental and climate impacts associated with how oil gets to Minnesota.